Women who are pregnant are often warned to avoid many unpasteurized foods that can harbor listeria. So why is this bacterium such a threat during those nine months? In early pregnancy, listeria left untreated can cause miscarriage and other pregnancy threats. The first trimester of pregnancy is the most fragile and important time for fetal growth and development. With so many factors affecting a healthy pregnancy, there can be many causes for miscarriage. Although the cause may not always be known, many times a doctor can provide laboratory testing to indicate the reason for a miscarriage. Listeria has been implicated as a cause for miscarriage and stillbirth far too often. 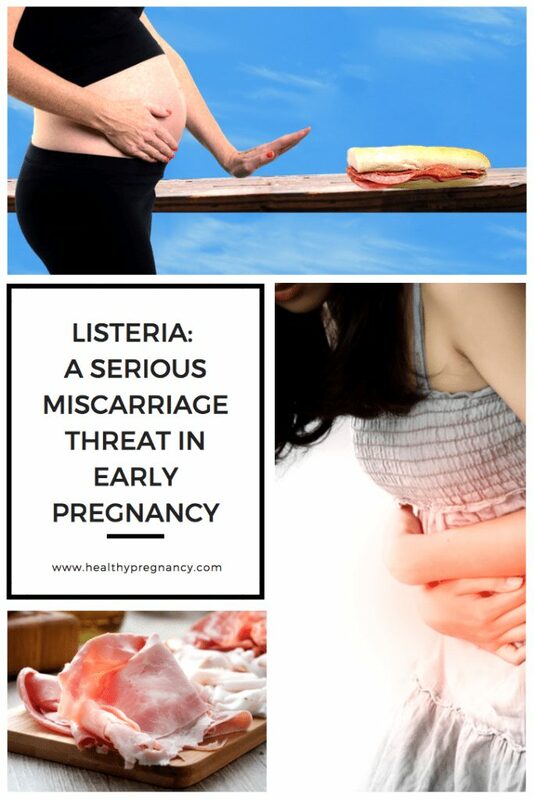 By understanding what listeria is and how to avoid it, the risk for miscarriage and stillbirth by this infectious agent can be mitigated. Listeria monocytogenes is a pathogenic bacterial species usually acquired from contaminated foods. When people are infected with listeria, it may be called listeriosis. This organism can be especially concerning for those with a compromised immune system and pregnant individuals. Found in meat, poultry, seafood, fish, raw milk and sausages, these items must be cooked well to prevent transmission. Only during cooking (at a temperature of more than 149 degrees Fahrenheit) bacteria are killed. Unfortunately, Listeria can also be found on raw fruits and vegetables, although it is not as common. This bacterium is capable of avoiding certain mechanisms of the immune system and can cross into the placenta during pregnancy. In addition, infection can be caused by direct contact with infected humans and animals. Knowing listeria is a pathogenic bacterium that can infect the placenta it is important to understand how it can affect the first trimester of pregnancy. When a pregnant individual contracts listeriosis, their immune system may not be able to destroy all of the bacterial cells before they migrate to the placenta. When this happens the listeria pathogen can attach to the placenta and make microabscesses where it will reside for the duration of the pregnancy unless drastic treatments are given. Even after the initial infection is treated, these abscesses can continue to harbor the bacteria leading to concurrent infections. Listeria infection can cause miscarriage, preterm labor and certain infections in babies after birth. The incubation time can be up to 70 days. Laboratory tests are necessary for an appropriate diagnosis. Usually a blood culture test is performed to diagnose listeriosis, although any tissue or bodily fluid such as fruit water, stool, brain fluid or vaginal discharge with listeria can be tested by a laboratory. Proper treatment is imperative for a successful pregnancy. In extreme cases, infection with listeria can be fatal. For example, severe sepsis, meningitis or encephalitis may occur. Also the infant, which is either infected by the blood circulation of the mother or the birth canal, can be seriously affected. Chronic granulomatous disease belongs to the most severe form of the disease (Disorder of the immune system, which can lead to death). The baby may have symptoms either directly after delivery (early-onset) or up to four weeks later (late-onset). In early-onset disease the infant often suffers from sepsis, meningitis and pneumonia. In late-onset infection, listeriosis is usually transmitted to the child only during childbirth. In many cases, meningitis occurs. The mortality rate is lower for late-onset infection. Possible exposure to listeria in symptomatic patients during pregnancy is taken seriously by prenatal providers, with treatment beginning immediately. Depending on any medicinal allergies, listeria during pregnancy is typically treated with intravenous (IV) antibiotics such as penicillin, amipicillin and amoxicillin, usually in combination with gentamycin. According to experts, the therapy should take at least three to four weeks. The earlier an appropriate treatment is performed, the lower the risk of miscarriage and the infection of the baby. The risk posed by listeria during pregnancy is the reason pregnant women and those trying to conceive are told to avoid certain foods. By cooking all raw foods to a safe temperature, the threat of listeriosis is nearly eliminated. It is important to thoroughly cook all meat, even shelf stable and sandwich meats. Raw milk products, sliced ​​meats and sausages, as well as smoked and raw fish, should be completely avoided. Fruits and vegetables should be thoroughly cleaned before consumption, salads are best prepared by your own! After every toilet visit and animal contact, as well as after handling food, the hands should be thoroughly washed and clean towels should be used. Avoiding all raw foods can be difficult, but it is the best way to prevent listeriosis in early pregnancy.